OK…they aren’t very green in January, but that’s why we need volunteers to feed and water our herd year round. And keep an eye on the herd dynamics. Then each horse gets specific food AND hay twice a day plus a once-over just to make sure no one is limping or has another medical issue. And of course, they all need to be petted and told how much we appreciate the wonderful job they do as “therapists in horseshoes.” Who wouldn’t love that? We are always looking for great Feed Team members. 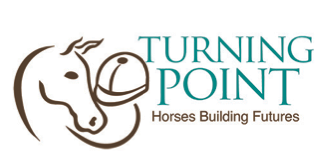 Just email us at volunteer@turningpointriding.org.